Unique Moments Photography of Gig Harbor Washington captured this image at The General Store Wedding and Event Center Roy WA. The venue is smaller and ideally set up for weddings that are 125-150 or less. It used to be a steak house and bar but it has converted to a wedding venue. The owners are very nice and will go out of their way to take care of the clients. Food is awesome. The outside area can also be used to have your ceremony as was the case with this bride. This picture was on the dance floor area and one of our favorites from the wedding. 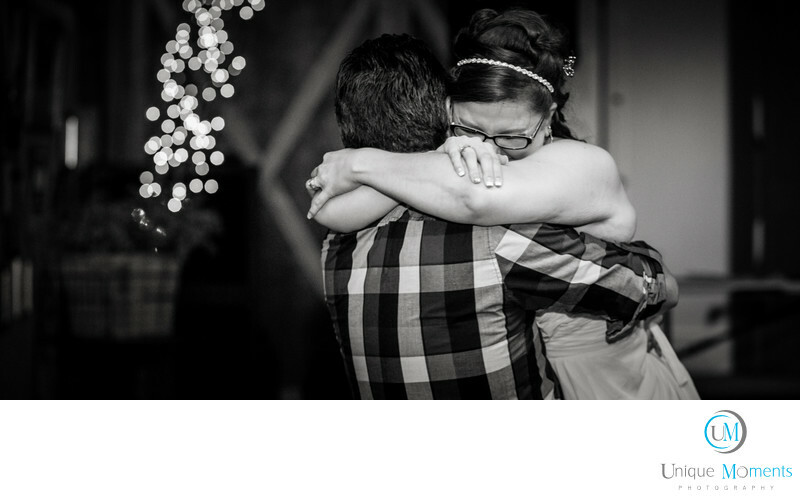 This was the bride and her twin brother as they gave each other a Hug while dancing. We shot this with a 50MM lens as the dance floor is a little small and long lens (reach) wont work well inside this venue. 85MM tops is all i would bring inside. Location: Roy, WA Phone:(253) 459-2124.